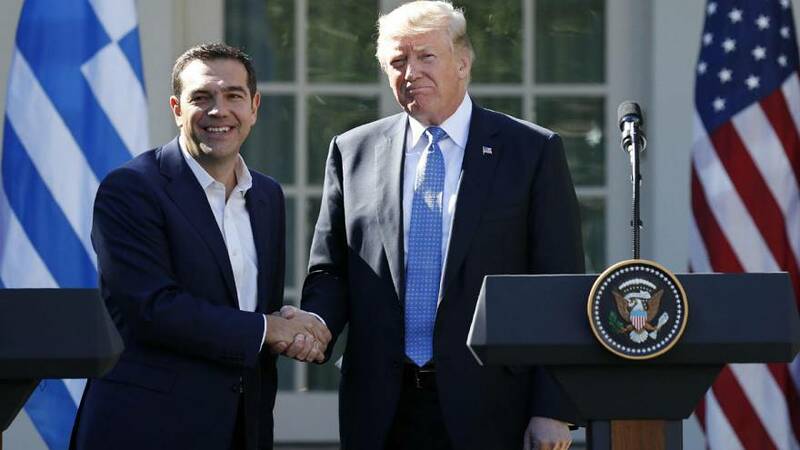 US President Donald Trump and Greek Prime Minister Alexis Tsipras have put trade and investment at the top of their joint agenda during a visit by the Greek leader. It’s been a chance to put past differences behind them – Tsipras once predicted a Trump presidency would be “evil” while Trump told Greece to “get out of the euro and stop waisting time”. “I’ve encouraged the prime minister in his continued implementation of reform and reform programme and I’ve totally reaffirmed our support for a responsible debt relief plan. A strong and flourishing Greece provides immense opportunity for American trade investment and job creation,” President Trump told reporters in their joint press conference. “It’s clear that our strategic cooperation with the United States becomes more important than ever. We are looking forward to attracting important American investments and more substantial support from the US in our effort to come out of this terrible crisis”. Specific areas also covered – NATO and a possible F-16 aircraft upgrade to Greece. With relations apparently set on a more solid footing a Trump trip to Athens now seems on the cards.